Posts on this site are never sponsored. If you’re a Metro Vancouver resident, chances are that you bring your own re-usable shopping bags to the store. You might even bring your own re-usable produce bags. Then at home, between the compost, paper recycling, container and hard plastic recycling, and plastic bag recycling (back at the grocery store), what remains in your garbage can is mostly other plastics (and, especially during allergy season, tissues). Now there’s a place for all that other plastic. 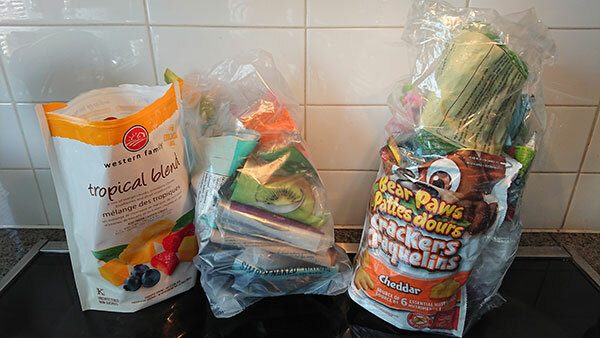 In our house, that other plastic includes frozen fruit packaging, baby food stand-up pouches, crinkly snack bags such as chips, granola bar wrappers, bubble wrap envelopes, and much more. London Drugs now accepts what they call flexible plastic packaging. That’s of course in addition to all the other things they accept such as Brita filters and batteries. In its blog post about the flexible plastic packaging program, it mentions all of the examples of packaging they accept. I find the flexible plastic packaging versus soft plastic packaging distinction a bit confusing, but there are a lot of items in the list, and in the comments section, they do their best to answer consumer questions. The post also states that the collected plastics will be used for recycling research and development. In other words, the material won’t necessarily be recycled yet. For now, at least it’s being kept out of the dump with the long-term goal of recycling more of it. Recycling plastics: your municipality accepts more than you think! There is a never-ending and annoying supply of gadgets and widgets that solve every household problem, whether you knew you had the problem or not. The TubShroom is one of them. But it works, at least for me. I was tired of my bathtub drain clogging what seemed like every couple of months. The shower started to pool fast, the water drained slowly, and I got a lovely soap scum ring in the tub. Sometimes the plunger did the trick, sometimes the drain snake / auger, and sometimes the dreaded Drano. Often they’d only work partially. Naturally I wondered whether there were issues with the pipes. 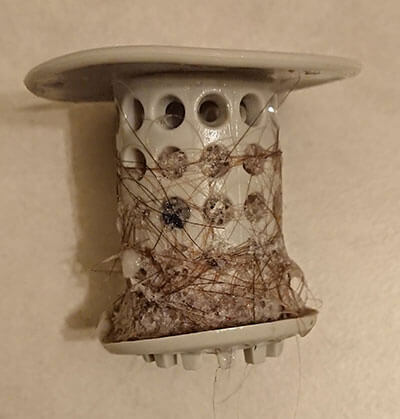 I’m sure that it does not catch “every single hair, every single time” as it claims, but it catches tons of long hairs that would have otherwise caused a backup further down in the pipes. The TubShroom essentially causes a mini-backup every week or two, but it’s so straightforward to remove all the gunk, and I would much rather do that then have a major backup that I cannot see or access. Yes, a mesh strainer tries to do something similar, but when we had one, it never seemed to catch as much, nor was it as simple to clear out. I can confirm that the TubShroom is easy to install. It’s flexible yet sturdy enough since it’s made of silicone. It fits right in to where my normal tub stopper is. Just make sure that you have a standard 1.5-inch drain. I cannot guarantee that it will work for you, but I can say that the TubShroom works very well for me and I can recommend it. I recently installed a Samsung 960 Evo SSD hard drive in ThinkPad T470 laptop (after having already purchased and received the laptop with a standard hard drive in it), and it was much more difficult than expected. Even though this was technically still cheaper than just buying the ThinkPad T470 from Lenovo with an SSD in the laptop in the first place, it took weeks to get the correct parts, and I certainly wish I’d paid the extra money up front. Putting the Samsung 960 Evo SSD directly in the ThinkPad T470 without having to purchase additional parts. There is an M.2 slot in the machine, but the physical space available to put something in that slot is way too small to put the 960 Evo. Had I purchased the ThinkPad with an SSD already in it, the necessary slot would have been available in the standard hard drive area. Putting the Samsung 960 Evo SSD in a third-party internal hard drive bracket. I thought the StarTech.com M.2 to 2.5 inch SATA converter (7mm height) looked and sounded perfect, until I discovered firsthand that the 960 Evo does not fit in it. This is because the 960 Evo is an “M key”, as opposed to a “B key” or “B+M key”. I was never able to find a generic, internal hard drive bracket / M.2 to SATA adapter that supports the “M key” connection. Putting the Samsung 960 Evo SSD in a third-party external hard drive USB enclosure. As per the point above, the “M key” connection on the 960 Evo makes it unsuitable for a standard SATA USB enclosure. There might be such an external enclosure that supports the “M key” connection out there, and hopefully this becomes more common over time. Booting Windows from the existing hard drive (that came with the ThinkPad T470) from a USB enclosure. The goal was to use Samsung’s Data Migration software to copy the existing drive and operating system to the new SSD. Clearly I had and still have a lot to learn about SSDs! Airbnb has become a very useful option for business travel. It can be cheaper than a hotel, but you can also often get a more convenient location and better amenities such as a kitchen. You also have many more options in case you want a place with multiple rooms. Airbnb for Business has made normal Airbnb much more convenient for my small business. Just like Uber for Business, you can have multiple sub-accounts that can all charge trips to the main account and credit card. This way, employees can choose their own accommodations and book their own trips! 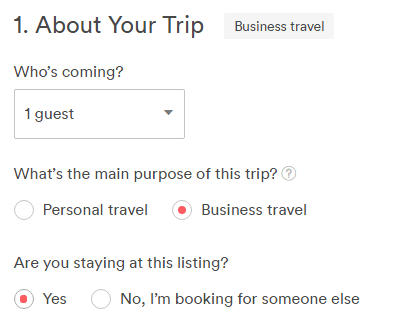 Before I started using Airbnb for Business, I’d have to play middle man and make a booking on behalf of my employees; this took up my time and I’m sure the hosts would have preferred dealing directly with the person who would be staying at their place. 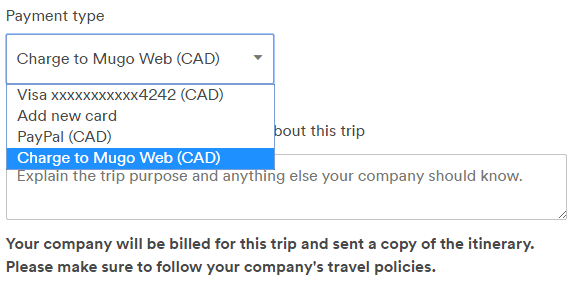 This then allows them to select the option of charging the trip to the company credit card. This way, they don’t have to use their own card and wait to get reimbursed. They also don’t have to have the company credit card in their possession. From an administrative standpoint, I can see all trips made by my employees in the Airbnb for Business dashboard. This centralizes the information I need to do accounting. I can of course add and remove employees under the business account. I can also add “bookers” who can book on behalf of other employees, and “managers” who can view the report information. 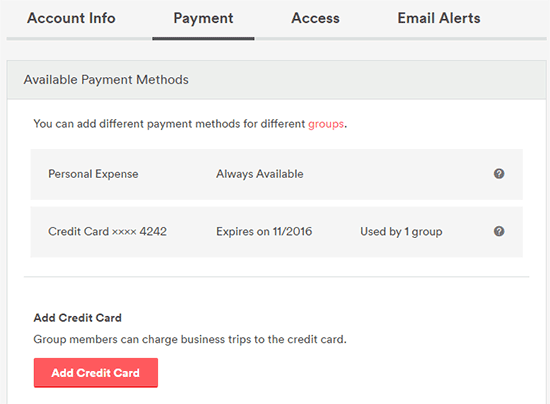 I can also manage the credit cards on the business account and assign different cards to different groups if needed. Lastly, there are e-mail notification settings. 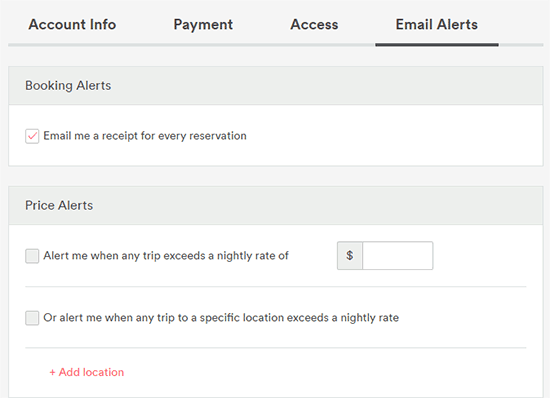 I can choose to receive an e-mail for every booking, and I can also get special alerts if the nightly rate exceeds a particular threshold. I highly recommend Airbnb for Business. While the basic Airbnb service has its own merits, I appreciate how it is providing tools for my small business that traditional hotels could have provided long time ago! 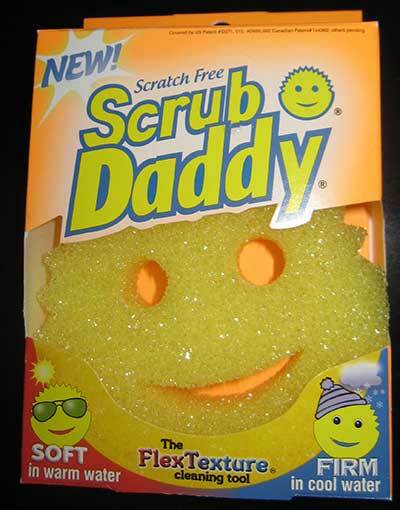 I decided to try the Scrub Daddy kitchen scrubber , which became famous mostly through Shark Tank. It cost $6 at Bed, Bath, and Beyond — it’s cheaper in bulk packs, but still at least 2-3 times the cost of normal kitchen scrubbers. 1. It does not last long. After 2 weeks of normal, daily use on kitchen dishes, it started to fall apart. This is in contrast to a standard kitchen scrubber, which lasts for at least 1 month before I consider replacing it. Once the Scrub Daddy starts disintegrating, little yellow pieces of the scrubber come off pretty much every time you touch it. 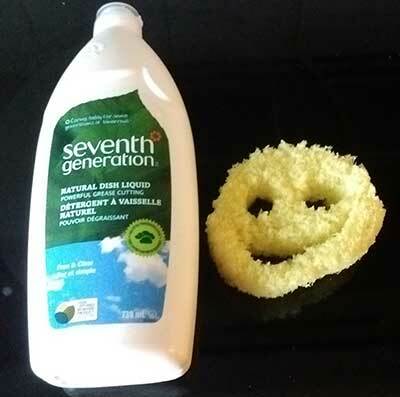 While this deterioration happens to normal kitchen scrubbers and sponges, the rate at which the Scrub Daddy falls apart is significantly faster than any other scrubber I have used. 2. It does not hold soap well. This is probably a side effect of the Scrub Daddy’s scrubbing effectiveness, but if you’re used to putting soap onto your scrubber, you will probably find that you end up using much more soap with the Scrub Daddy. When I Tweeted about Scrub Daddy’s durability issues, I got a quick reply from them, suggesting that I contact their customer service. Customer service over e-mail was very friendly and prompt. Basically, they asked for more information about how I used and cared for the scrubber. My use was nothing out of the ordinary, and the care instructions for the Scrub Daddy are no different than any other scrubber. They kindly sent me another Scrub Daddy, suggesting that I should get better results than with the first one. However, I found the same disappointing durability as before. When I searched online for other reviews of the product, I found that most people have a similar experience. I was impressed by Scrub Daddy’s customer service, although customer service is not something you expect to need for a kitchen scrubber. 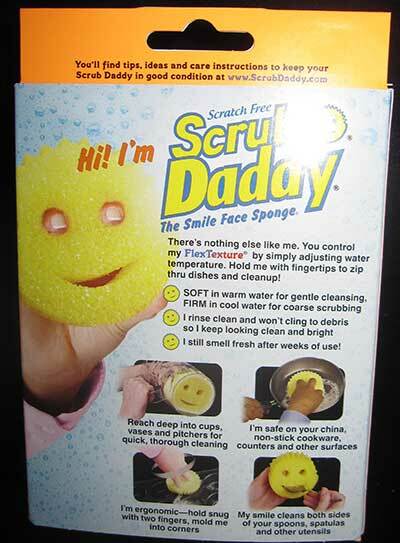 In short, the Scrub Daddy is smiley, good at scrubbing, and a great success in marketing, but I cannot recommend it over a standard kitchen sponge. You could keep it on hand as a special-use scrubber for a small percentage of your dishes, but that seems like a lot of trouble, not to mention the cost!